FT Island took over a DVD chart in Japan with a concert DVD for its concert in Korea. 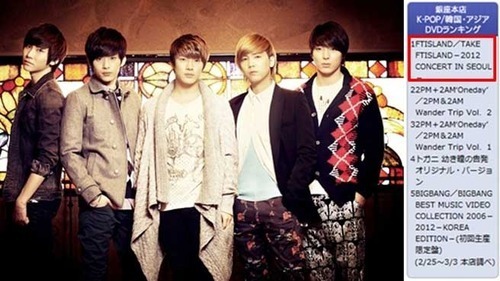 The band′s 2012 Take FT Island in Seoul DVD managed to top Yamano Music′s weekly K-Pop DVD chart with sales from February 25 to March 3. Take FT Island was held in Seoul from September 1-2, 2012, and at the time made issues for drawing fans from Denmark, Spain, Italy, Poland, Japan and other countries from around the world. A part from I Wish, the promotional single from the group′s Five Treasure Box album, had been sung as a preview during the concert, along with a total of 21 songs, including its self-written tracks such as Life, Paper Plane,Compass, Let It Go! and Wanna Go. The band will be releasing its 10th Japanese single album You Are My Life on March 27. It will hold an official fanmeeting in Osaka and Tokyo on March 10 and 17 beforehand to launch its promotions in the country.